Victor Gilbert was considered the foremost painter of the place du marché (the marketplace) during the final decades of the 19th Century in France. By the middle of the century there was a proliferation of daily markets throughout the French capital which were needed to both feed the growing city and cater to the whims of the growing middle and upper classes. Fresh fruits, vegetables and especially flowers flowed daily into Paris to please the tastes of its inhabitants. 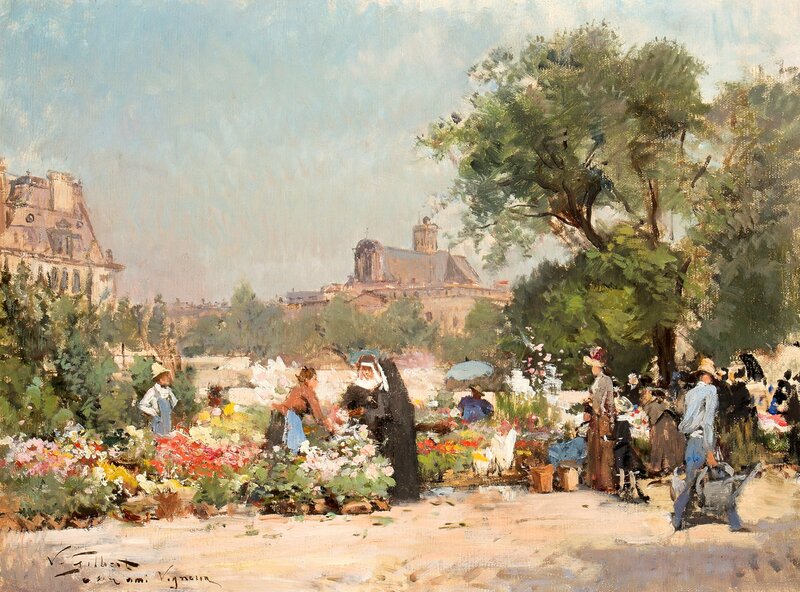 Here, Gilbert has depicted the Parisians from every social scale at one of these daily flower markets. Local peasants are seen selling their wares while bourgeois ladies and nuns ponder over their purchases. The artist has drawn the viewer into a wistful time gone by, where the fragrance of the flowers still lingers. Victor Gabriel Gilbert attended the École de la Ville de Paris, studying under Pierre Levasseur and Georges Louis Charles Busson (1859-1933). He exhibited at the Parisian Salon in 1871 and 1873 and then obtained a silver medal at the Salon des Artistes Français in 1889, received the Bonnet Prize in 1926 and he was named Knight of the Légion d’Honneur in 1897. Gilbert focused on the city where he lived his entire life; he painted views of colourful Parisian life documenting the boulevards, cafés and the flower stalls. At the same time he turned his effect on the portrayal of adorable children, achieving soft tenderness with his brush. It was during the mid 1870s that Gilbert became a close friend to Pierre Martin (1868-1935), a poet who was one of the principle supporters of the Impressionist movement. As a result, Gilbert’s paintings entered an important collection of Impressionists including works by Monet, van Gogh, Cézanne and Gauguin due to his attention to light and his soft colour palette.